Helicopters get noticed in this military town. Three major military bases within a fifty mile radius, you really can't help noticing. When we lived in Germany, our building was right next to the helipad for the hospital. Morning, noon, or night, the helicopters were flying over, bringing someone seriously injured to be treated. If we kids were out on the playground at the time, the copter would fly right over us, and you could see the medics faces as they passed, because the door of the helicopter was always open at that point. We would wave like crazy people, because that is what kids do. Occasionally we would get a little wave in return, but soldiers on duty take their jobs very seriously, so that was rare. Nowadays, the copter flying over us might not even be military. All the "big" news channels have their own helicopters, and they're out flying to big football games or over major traffic accidents. Air Life or companies like them fly people to trauma centers all the time. Yep. 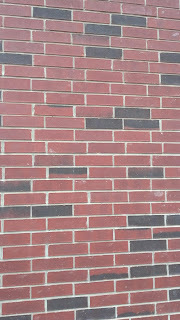 Random Brick Wall. My life at the moment. It's springtime and here is your obligatory spring photo of bluebonnets. These seemed a bit more intense in their color than others. 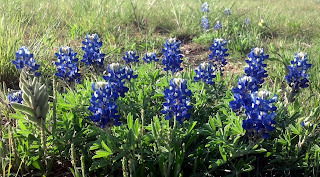 I took my dog Maisy out for a walk this weekend, and we found these bluebonnets. Bluebonnets are the State Flower of Texas, although I am really not sure why. They're not found only in Texas, after all. Probably something to do with Lady Bird Johnson, the late and great former First Lady. Or, knowing Texas politics, the Legislature threw a dart at random flower pictures and that was that. 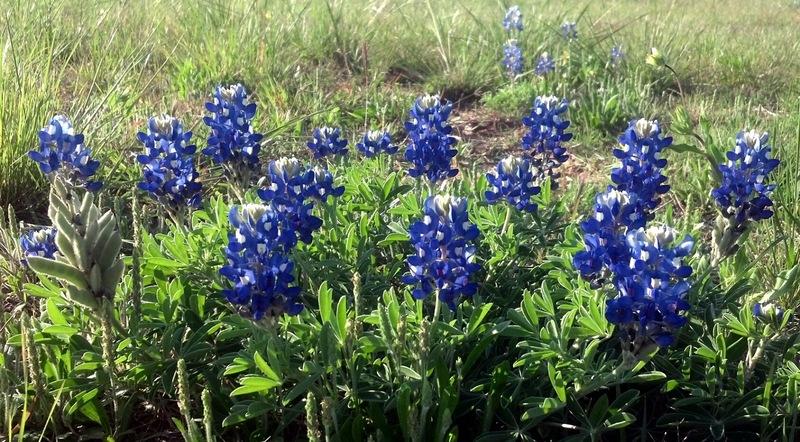 It is not, as is widely thought, illegal to pick bluebonnets. It should would be a shame to waste all that pretty color by picking them, however! All of the wildflowers are starting to show up along the highways and in random places where you least expect them. I'm okay with suddenly finding something beautiful--it puts a smile on my face. In other, less colorful news, they've found a new spider out there. In Sri Lanka. It's a new tarantula, and it lives in trees and it is the size of your face. Really. Look at your face in the mirror and imagine a SPIDER. The. Size. Of. Your. Face. Do you now have a horrible case of the heebie-jeebies? Is your skin crawling a little at the idea of a spider(the size of your FACE!!!) falling out of a tree and landing on you? I like spiders(from a distance, of course) and I'm completely creeped out. A spider that big could kill and eat my cats, fer cryin' out loud! And this new spider is not even the biggest spider out there! Oh, and did I mention that it is venomous? Yikes. One reason to never visit Sri Lanka, I suppose. This past weekend, Zane's coach was walking by our car when we arrived, so I let Zane out, gave him his soccer ball and told him to stay with Coach Kevin. Then I gathered all of the items we would need for the game(it was our turn to bring the snacks), and hauled it all over to the field by myself, since Larry was wearing his Commissioner hat. I get to the sidelines...no Zane. I see the coach, and I see Zane's team, warming up. No Zane. I start to panic a little...and then I see him. (Every mother knows her children when she sees them, even if they're so far off as to be blurry blobs in the distance.) My child, who was specifically told to stay with his coach, is wayyyyyyy over on the other side of the fields...with a couple of nine year old girls! Well! I stomped over there and unleashed on my son in a most spectacular fashion. By the time we got back over to where his team was getting ready to take the field, he was in tears. I didn't feel the least bit guilty--he ran off without letting any body know where he was, and he needed to feel bad about that. Larry actually started making excuses for him, saying that "he had told Zane that he could go with Lilly" the day before, etc. I am not buying that. This is a big time safety issue for me. Zane knows no enemies; he is friendly to everyone. He doesn't know what lurks out there in the hearts of some people, but I do. He doesn't know that there are people out there who would hurt him, or worse. I intend to protect him from that knowledge for as long as possible. He's a kid, and if I have anything to say about it, he will stay a kid for as long as he can. Head over to Stacy's today! UGH! That "where is my kid" feeling...instant stomach ache! 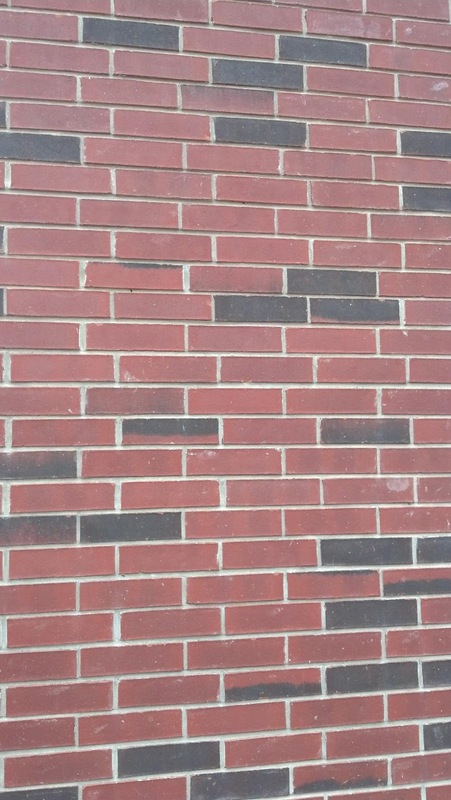 Thanks for the spidey update! Gorgeous shot of the bluebonnets! And I'm with you - suddenly finding something beautiful puts a smile on my face, too. I would have read Zach the riot act, too - I'm exactly the same, I want to protect my kidlets as long as possible and stay kids for as long as possible. The world is a scary place!! 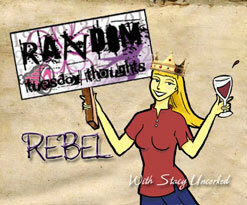 I enjoy your random thoughts. It is hard to get kids to understand they can't just wander off.